How do I get my camera's specifications to show or not show up when I submit a picture? If your camera adds EXIF data to your photograph, then it will be extracted automatically during the submission process. Being an automated process, you cannot specify how the EXIF data is displayed. EXIF data usually contains information about the date and time a photo was taken, resolution, camera settings for that particular shot (ISO, shutter speed, aperture, etc. ), whether the flash was used, camera model, and so on. The information included is not only dependent on your camera, but also what our system can include from your camera. An example of how your camera's information will be displayed, when your deviation is posted can be found in the box, selected in blue below. If you would like to add a border to your image without losing your EXIF data and you're using Photoshop you can do this by going to 'Image > Canvas Size', you will next need to add any space that you wish to add and then proceed by saving your image as normal. Q: I followed the steps, but my image is not displaying any of my Camera's information. What could have gone wrong? If you have followed the steps above and the data is still not displaying, then you'll have enter the information manually by typing it in to your description. 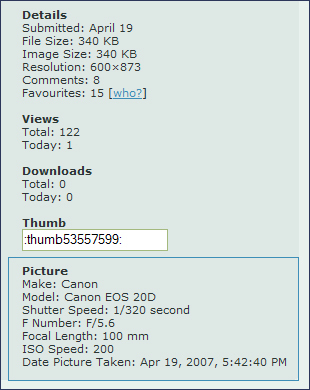 I do not want my camera's specifications showing up on my deviations. How can I turn this off? To do this you will need to strip the EXIF info from your images before posting them. You can strip this information by copying your original image in to a new file, or if you are using Photoshop you can do this by using their 'Save to Web' option.